Soft tissue is a crucial component of the human body that serves to connect, support, or surround other structures. Seeing as the main component of soft tissue, collagen, is the most abundant protein in mammals, it is of utmost importance that this tissue remains healthy. Complications with soft tissue can result in a myriad of medical conditions that often can only be treated successfully via surgical intervention. Historically, soft tissue related ailments were often treated using native grafts from the patient’s own body. This autologous grafting still plays an important role in the treatment of soft tissue, but it does have its limitations. Since the tissue must be harvested from somewhere else on the patient’s body, often there simply isn’t enough tissue available to remedy more severe conditions. This technique also results in increased scarring and adds valuable time to the surgical procedure. A surgical method of treatment that offers an alternative to autologous grafting is the use of manufactured grafts composed of synthetic materials. These alloplasts became popular in the last few decades, as they provided a treatment option that sped up rehabilitation by avoiding the harvest site morbidity associated with autologous grafting. The downside to these synthetic mesh grafts is that unlike grafts sourced from the patient’s own native tissue, the implantation sometimes elicits a foreign body reaction which can lead to the grafts being rejected by the patient’s body. This adds unnecessary costs because, in these cases, a follow up procedure to remove the synthetic graft needs to be performed. Furthermore, throughout the 2000s there were some highly publicized cases of patients being injured by the erosion of synthetic mesh in their bodies following hernia repair procedures. At around the same time, reports surfaced of similar complications relating to the erosion of synthetic vaginal sling mesh in patients following their implantation procedures aimed at treating urinary incontinence. The FDA intervened and issued warnings related to synthetic mesh and the possible complications it can cause. These incidents resulted in severe chronic pain and infections for the affected patients and led to thousands of lawsuits against some of the larger synthetic mesh manufacturers. Many of these companies eventually quietly pulled some of their products from the market in response to the negative publicity. An alternative to both autologous grafting and synthetic mesh products is the use of biologic grafts sourced from human cadavers (allografts) and non-human animals (xenografts) such as cows or pigs before being sterilized through various proprietary processing techniques. This option arose in the mid-nineties with the advent of AlloDerm, manufactured by LifeCell. This lucrative allograft product had a huge impact on the soft tissue market and gave rise to the ongoing trend favoring non-autologous soft tissue grafts. These biologic grafts are the best of both worlds: they don’t require the patient’s own tissue as is required by autologous grafting, and they are more biocompatible than the synthetic products, demonstrating vastly reduced rates of graft rejection. One of the only limitations of these advanced products is their inherently higher price, which is often more than double the amount of the synthetic alternatives. Two important intertwined factors have alleviated this limitation in recent years. Firstly, as AlloDerm has been around since the early 90s, it has amassed a vast body of literature supporting its efficacy, being included in over 100 peer-reviewed studies since its inception. Secondly, due to widespread surgeon acceptance and favorable longitudinal clinical data, these biologic mesh products are fully reimbursed in many of the indications they’re used for including hernia repair and breast reconstruction. In contrast, wound management related reimbursement changes this year have negatively affected the skin repair market, which will suffer a slight decrease next year before rebounding over the remainder of the forecast period. The success of biologics in these areas has played a large role in the impressive expansion shown by the overall soft tissue reinforcement and regeneration market, which grew by almost 7 percent last year. This positive growth is expected to continue through 2021, fueled mostly by the biologic market, which is expected to show double digit growth over the forecast period. The synthetic market is still prominent and will also continue to grow over the forecast period, albeit at a lower rate. The breast reconstruction and hernia repair markets together compose over 50 percent of the total soft tissue reinforcement and regeneration market, largely due to the penetration of biologic grafts within these markets. Hernia repair is the most common surgical procedure in the U.S., with over one million hernias repaired per year. Xenografts, namely LifeCell’s Strattice, have started being increasingly used for hernia repair. This trend is most notable for ventral hernia repair, where xenografts are becoming preferred by surgeons as they offer the large amount of tensile strength required to reinforce the abdominal wall to prevent post-operative re-herniation. In the breast reconstruction market, allografts have become the gold standard as they offer superior aesthetic results, harboring the highest patient satisfaction ever seen with this type of procedure. Over 130,000 mastectomies were performed in the U.S. last year, and of these over 70 percent of patients elected for breast reconstruction. Due to advances in genetic screening technology, an increasing number of younger breast cancer patients have been opting for prophylactic contralateral mastectomies. Patients that decide to undergo a double mastectomy often follow up with a bilateral breast reconstruction procedure. Over 50 percent of breast reconstructions in the U.S. are bilateral as of today, and this rate has been increasing dramatically in recent years. This has resulted in large amounts of growth in this market, reaching almost 10 percent, as the majority of breast reconstruction procedures in the U.S. now use two products per procedure. Another notable factor contributing to the compounding growth of the biologic market is the continuous stream of clinical studies aimed at expanding the indications of these biologic regenerative products. This is especially the case in the dental soft tissue regeneration market, where regenerative products like AlloDerm, which were traditionally used for ridge augmentation and root coverage, are now being used to increase soft tissue thickness around implants. Due to these advancements, the dental soft tissue market has been showing growth in the mid-teens. This is also the case for the sports medicine and tendon reinforcement market, which has been showing high single digit growth as biologic grafts are being used more to treat severe tears of the Achillies tendon. Skin repair biologic grafts have also benefited from recent expansions of indication, and are now used to treat chronic wounds such as diabetic ulcers along with burns. In response to both the backlash against synthetic mesh products following the FDA warnings and associated lawsuits and the gaining popularity of biologic grafts, newer composite synthetic grafts have been gaining traction. These composite products are designed to compensate for the problem of graft rejection by being coated with biocompatible materials. This makes these grafts safer and reduces the likelihood of them causing infection and initiating the body’s foreign body response. Composite mesh is inherently more expensive due to the biocompatible coatings, and these newer products are expected to continue to benefit the synthetic soft tissue reinforcement market. Composite mesh has been very successful in the markets that were negatively affected by lawsuits, namely the hernia repair and vaginal sling markets. Composite products are also available in pre-shaped forms designed specifically for certain procedures, which is popular among surgeons as it simplifies the surgical implantation procedure. Newer absorbable synthetics have also become popular choices for hernia repair, and many companies are developing hybrid grafts that blur the lines between biologic and synthetic. Over 50 companies participate in the market for soft tissue reinforcement and regeneration in the United States. The vast number of competitors is mostly due to the fact that soft tissue related ailments cover such a wide range of areas. Within each area there are usually a few large players that dominate the market followed by a myriad of smaller companies with their own specific niches offering specialized products. Another significant trend in the competitive landscape is the development of knock-off products by larger companies that specialize in other areas but are hoping to take advantage of the burgeoning biologic market. LifeCell is the clear leader in the U.S. soft tissue repair market, occupying 25.5 percent of the total market. The company offers two flagship products; the AlloDerm regenerative tissue matrix, which is derived from human dermal tissue, and the Strattice reconstructive tissue matrix, which is derived from porcine dermal tissue. The majority of LifeCell’s revenue is derived from the clinical applications of challenging hernia repair and post-mastectomy breast reconstruction, which is generated primarily in the United States in the acute care setting on a direct billing basis. The company has had the longest tenure in the biologic soft tissue market, and many other companies in this market have released their own biologic products based on AlloDerm and Strattice. LifeCell is one of the few companies that actually has valid longitudinal studies using its product, due to the fact that AlloDerm has been on the market for over two decades. Organogenesis is the only other company that has experienced success in the biologic soft tissue market that is comparable to LifeCell. They compete in the skin repair market with their two skin substitutes, Apligrafand Dermagraft. Apligraf is a bilayer sheet that contains an inner layer of epithelial cells and an outer layer of protective skin cells and is indicated for diabetic and venous ulcers. Organogenesis has also acquired the Dermagraft product from Shire, which has boosted their overall market share presence. Dermagraft is a cryo-preserved human fibroblast-derived dermal substitute that is approved for the treatment of diabetic foot ulcers. The synthetic market is dominated by C.R. Bard’s Davol division, Johnson & Johnson’s Ethicon division, and Covidien. These companies have offered synthetic mesh for decades and have successfully adapted to the trend away from traditional uncoated synthetic products by not only developing safer, state-of-the-art composite mesh products, but also releasing their own versions of biologic tissue matrices that have shown impressive results thus far. The information contained in this article is taken from a detailed and comprehensive report published by iData Research Inc. (www.idataresearch.net) entitled 2015 U.S. Soft Tissue Reinforcement and Regeneration Market Report . For more information and a free synopsis of the above report, please contact iData Research at info@idataresearch.net. 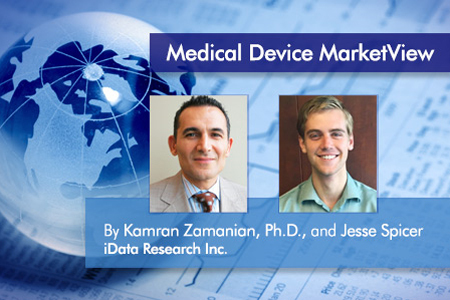 iData Research is an international market research and consulting firm focused on providing market intelligence for the medical device, dental, and pharmaceutical industries. Jesse Spicer is a research analyst at iData Research and was the lead researcher for the 2015 U.S. Soft Tissue Reinforcement and Regeneration Market Report. He was recently quoted in Reuters for his expertise in the U.S. biologics market. Kamran Zamanian is CEO at iData Research.